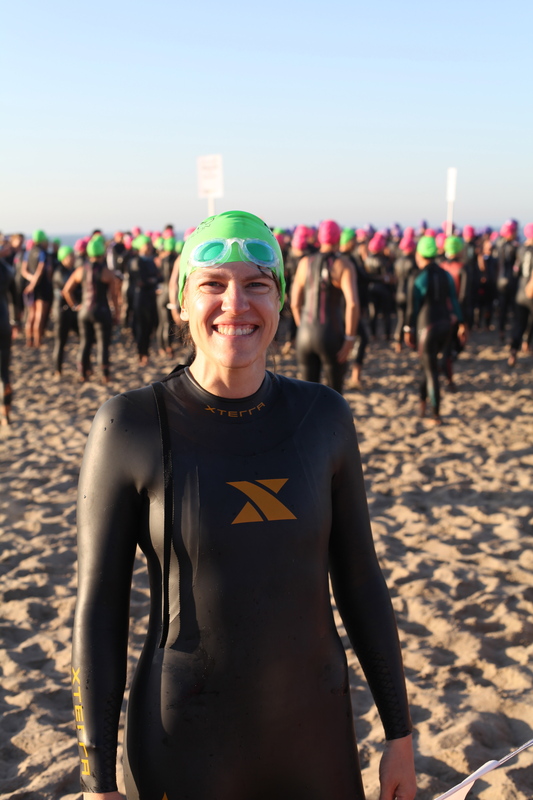 Long story short: I decided to do the Nautica Malibu international distance triathlon this weekend and I am very glad I did. It all started with picking the girls up from school a half hour early. “Do they have an appointment?” Ummmm…. “They have my appointment [to pick up my race packet in Malibu by 6 p.m.].” Off we went, safely to arrive at Zuma Beach by 5 p.m. Got my race packet with timing chip, race number, t-shirt (yes I will fit a women’s small I’m-just-wearing-a-poufy-blouse-thank-you-very-much) and bright green swim cap. I swear I’m not five months pregnant. I discovered I’d be in wave number 10, the last wave, which would start at 7:45 a.m. Not ideal given the forecast for 94 degrees Fahrenheit in Malibu on race day. The guy next to me at the race info board cheered me up by saying, “You don’t look like you’re over 40!” Apparently I was supposed to reply that he didn’t look like he was over 50, but I dropped the ball on that one. I told him to chalk it up to my race nerves. We camped for the weekend at Leo Carrillo State Beach Campground just nine miles up the road from Zuma. I felt a few adrenaline rushes over the course of the evening as I thought about the race the next day, but I calmly went about the job of sticking my race number on my helmet, twist-tying it on my bike, and pinning it on my race belt. 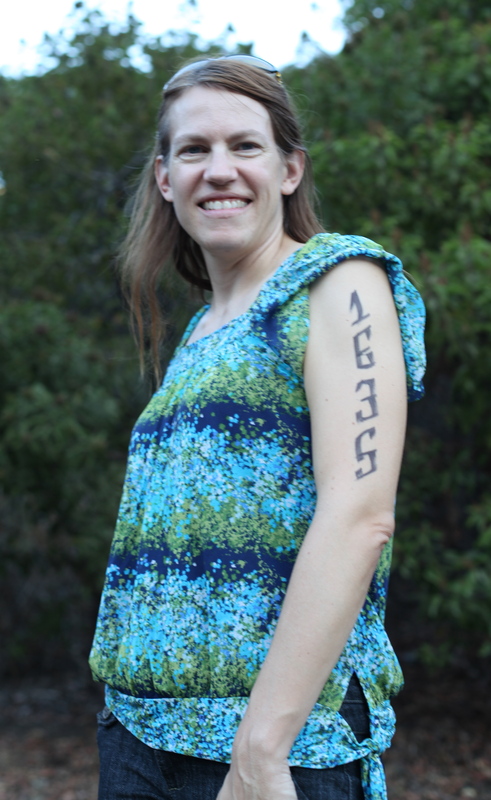 Yes, pinning it on, because I discovered that my four-year-old had taken the race number toggles off my race belt. I’d seen them around the house the day before but made no connection that that’s what they were. Stinker. Safety pins worked fine. We got to bed around 10:30 p.m. and I had little trouble going to sleep in spite of my race jitters. I guess that’s the advantage of no taper and my exhaustion at the end of a busy week and long drive. All too soon my alarm went off at 4:15 a.m. I chowed down a bowl of Corn Flakes and skim milk and a slice of whole grain bread. Not my usual pre-race meal because in all my effort to be less uptight about races, I forgot to pack the oatmeal. Oops. We loaded everyone up into the car under the starry sky. I felt bad to awaken the girls at that early hour, but that was the only way they’d be able to see me at the event and they wanted to film and photograph me for a school project. My four-year-old was such a trooper. She jabbered away the whole time I put her in her car seat. “I love you. You’re the best mom in the whole wide world. Thank you for taking us camping. I love camping.” We arrived at Zuma at 5 a.m., and I quickly unloaded for the long walk to transition, while Mike and the girls went back to sleep in the car. I snagged an excellent spot in transition, second from the front end of my rack. 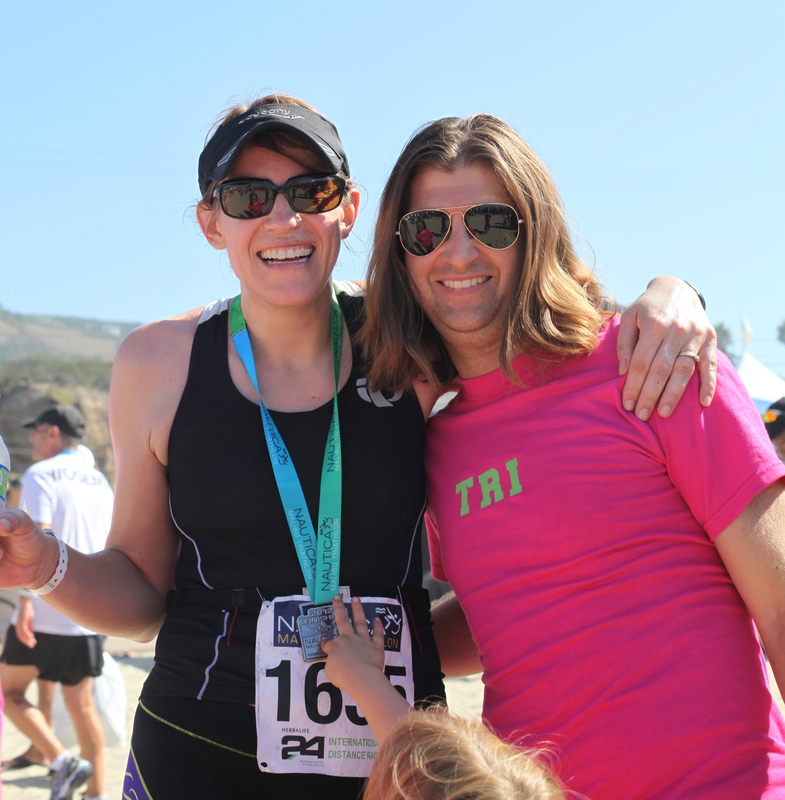 I chatted with Jill from northern California and she helpfully gave me some tips about the course and kept me distracted from any lingering race nerves. Triathletes are some of the nicest people you will ever meet. Competitive sure, but mainly against themselves. They know what it’s taken you to get there on race day, and they want you to have a great race too. After a quick race meeting at 6:30, we started the slow walk to the swim start. I downed a PowerBar Green Apple Gel around 7 a.m., just as the gun was going off for the first wave. I waited in the long line to use the women’s restroom one last time but quickly decided the ocean would suit me just fine. I dove in for a warm-up swim and had 20 minutes to spare before my wave start. I bumped into Alma, the woman I’d met at the swim clinic a few weeks before. She’d paid close attention to the earlier swim waves and gave me the advice to start off to the left of the pack because the ocean current was pushing swimmers right up the shore and past the first buoy. I’m telling you, triathletes are the most generous people (and I did try to pay back some of that generosity on the course). Less nervous than just plain excited at this point! As we waited for our wave to start, the ocean waves got bigger and bigger! Another disadvantage to the late start time. Thank goodness I had practiced at Zuma Beach twice before. Two people in my wave actually had to turn back and DNF. I felt so bad for them, knowing that the first time I’d tried to swim out past the waves in my practice swim, I’d had to turn back and try again later. I started out strong and did a good job entering the ocean. I battled my usual problem of adrenaline at the start and felt I couldn’t catch my breath. I never have a problem like that in the pool, so it’s particularly frustrating to me on race day. After I rounded the first buoy of six, I flipped to my back for some backstroke to get my breathing under control. At that point, the thought crossed my mind that I never wanted to do a triathlon again. That is laughable to me now that it’s done! It took me a long time in the swim to get to where I could do more freestyle than backstroke. I hit my groove by about the fourth buoy. I was going strong as I rounded the sixth and final one, and I swam hard for shore. I managed to catch two waves and on the second one, I body surfed so far in that I landed on my knees on the sand! What a rush! Swim time: 28:17, a PR over my prior HITS Palm Springs time of 31:11. Swim rank: 608 of 1142. Lots of room for improvement (a nice way to put it). I walked up the beach, mindful of not running barefoot on the sand with my plantar fasciitis. I’m sure that cost me some time in T1 but I used that time to get my wetsuit down and to catch my breath. I felt great at that point, happy to be out of the water! I had no problem finding my bike rack as I’d paid careful attention at setup in the morning. T1 time: 3:58. Again, more room for improvement. I felt strong heading out on the bike. That part of the race is my absolute favorite and if you asked me which is my strongest suit, I would say that, even though my times don’t bear that out, as you will see. The course is rolling hills up and down Pacific Coast Highway. I passed a ton of people and was only passed by one person that I did not pass back later. There are a couple of no-passing zones on the course and that frustrated me. I was good about using the time to grab a drink and do some recovery breathing to power myself after the no-passing zone ended. At one point I was slowed by an ambulance pulling out on the course. It was quite sobering, much like the time a lifeguard crossed my path on the swim at HITS Palm Springs. I was so annoyed then until I realized he was saving someone from drowning. Doh! I couldn’t tell if I was pushing too hard on the bike and would burn out on the run, or if I should push even harder. Unfortunately I had hit the wrong button on my Garmin and it was set for use indoors, only telling me the stopwatch time and not the pace! In retrospect I could have gone a bit faster. Bike time: 1:18:53, 18.8 mph, another PR over my HITS Palm Springs time of 1:19:25. Bike rank: 524 of 1142, top 45.9%. I goofed up racking my bike and had to flip it around but didn’t lose much time with that. I took a few extra seconds to squirt some sunscreen into my hands and I slapped that on as I ran out of transition. I’m sure I looked ridiculous, dripping in sweat and globs of white zinc oxide sunscreen, but it was totally worth it. I have a slight sunburn at the outside edges of what I could reach on my back! I’m guessing by the time I was out on the run, the air temperature had hit 80+ degrees. T2 time: 2:06. I wish it were under 2! My legs felt great for the run. I don’t remember feeling like I had lead legs like I often do coming off the bike. I ran by feel and effort, with no Garmin data to tell me how I was doing. In retrospect that was probably a good thing. I feel like I left everything out on the course. It was HOT and hard, not nearly as fun as the bike portion. I used the 6.2 miles to practice taking in fluids at the aid stations each mile. I missed one aid station, thinking I’d hit the opposite one as the course looped back, but I had misjudged the course and it was a long way back to that point! I was parched by the time I reached the next aid station. I grabbed water to pour on me and Gatorade to drink. The Gatorade tasted like liquid gold and I knew I needed the nutrition. At one point on the second half of the run, I passed a guy who then uttered, in the saddest Eeyore voice, “Five.” I strongly suspect I was the fifth female to pass him that day! I had to suppress a smile. I’m not even sure he knew he said it out loud. At mile five, I sped up as best I could, and when the finish line was in sight, I put on the kick. Now I know why I look so hunched over at every finish — I forget all about form (which I had been so good about practicing throughout the rest of the run) and I practically will my body across the finish line, leading with my head and neck! I did finish strong, if not pretty! Run time: 52:10, a PR over my HITS Palm Springs time of 55:35, but not a PR over my stand-alone 10K time of 51:29. Pace of 8:26. Run rank: 390 of 1142, nearly in the top third! Finish time: 2:45:34, a 7:24 PR over my HITS Palm Springs time of 2:52:58. My husband was quite impressed, given what he said was a harder (ocean) swim, a harder (hillier) bike, and a harder (hotter) run. Finish rank: 9th of 40 in my 40-44 age group, top 22.5%. 60th of 301 females, top 19.9%. 443 of 1142 overall, top 38.8%. One happy finisher and one awesome “TRI” husband! Things I would do differently: (1) work even more on the open water swim and get my breathing/adrenaline under control, (2) practice T1 to get my time down, (3) push even harder on the bike, (4) practice racking the bike so it’s second nature, (5) use spray sunscreen to get those unreachable spots. Things I’m really happy about: (1) I am super happy with my run time. The main reason I trained for a half marathon last spring was to improve my running form and speed after my last Olympic distance triathlon in December 2011. Mission accomplished! I cannot believe I was nearly in the top third of runners overall, male and female. (2) I’m amazed at my swim time as well, given how much of the swim I did with backstroke, and I know I can do even better next time. (3) Body surfing! (4) I am thrilled that I had a PR for all three disciplines and the finish time. As much as I debated whether or not to race, I know it was a good decision to do it. My feet feel no worse from the plantar fasciitis than they did earlier in the week, although I know it will likely take me an extra week now to recover and feel as good as they did on race day. Did you race or train over the weekend? How did it go? Yaaaay Angela! Three prs in one race, that’s amazing! I hope your body keeps feeling good this week. Thanks Holly! My feet feel surprisingly good today — I’m keeping on top of the stretching and that seems to help a lot. Congrats! That’s great that you felt good and did so well. Hooray for you! You were very smart during the three events and excellent at evaluating the good points and what goals to set for the next tri. All the persistent training paid off…and you had a ball. Handsome husband too. Awesome web site also. Thanks! Thank you! It all seems a bit surreal at this point. Yay! I wondered if you were racing. Congratulations on so many successes this weekend and a fantastic PR!! Thanks Rose! I’d definitely recommend this race. I’ll be writing a review of it later this week. I ran my first 5k since taking 5+ months off for plantar fasciitis/bursitis. I also ran “naked” without Garmin or watch even, which was enjoyable. 35:22 not too shabby for a comeback run (given that my PR is 27:50, and I was running with a pacer for that one). Thanks Geli! Congrats on running 5K, and in that time! How are your feet feeling? Do you still have some pain? You’re an excellent writer. I enjoyed your race recap! I’m doing some internet recon for future triathlons and your review was incredibly helpful. Do you happen to remember what the view looked like looking down in the water? I get spooked by high visibility water and actually prefer dark, zero vis beyond my own hand (which I know is strange, as most people prefer to see!). I don’t know what the waters are like in Malibu open water. Thanks Rhea! I think the visibility probably depends a lot on the conditions that day — choppy/windy etc. — but I don’t remember it being all that clear. I think I could see the bottom as I got close to shore but I don’t remember being able to see much when I was out past the wave break in deeper water. You would like the water in Mission Bay (San Diego).